Throughout 2017, the only books of travel writing I read were those written by women. It was a project borne of a realisation some months prior that all the travel literature I possessed and had read was by men. In an age when good, probing questions are being asked about gender equality across various aspects of society from politics to the creative industries, the thought occurred to me that my limited reading experience was not a healthy state of affairs. So I asked around, gained some recommendations (thanks to those who contributed! ), did some of my own research, and drew up a reading list. As a keen reader and writer of travel writing, I therefore spent 2017 reading this list of only female-authored travel writing – one book a month. I tried to approach this project with as few preconceptions as I can, but my aim was to find out what I’ve been missing and to reflect on what women can and do contribute to travel writing as a genre. You can read some or all of the same titles as I read, see my (and, occasionally, others’!) discussion on Twitter via the #ReadingFemaleTravelWriters hashtag, or read and comment on my related blog posts. The reading list I chose is below, along with links to my previews and reviews. It may not be a perfect list, perhaps there were titles I’ve missed that you think I’m a fool for not including, and I confess that the selection process was fairly brief and unscientific (see each book’s preview for the rationale behind my choosing it). 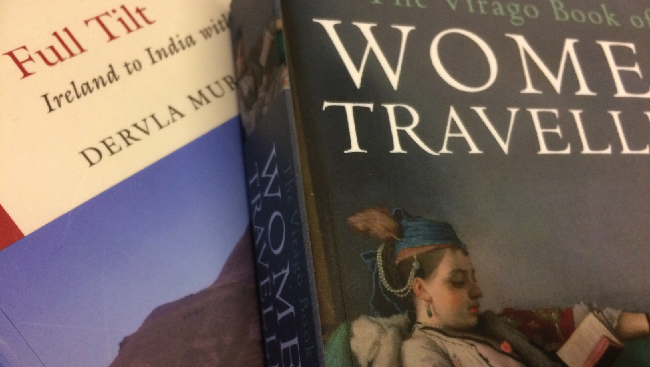 But hopefully the twelve titles represented a reasonable spread of eras, geographical locations, styles and interests, and was broad enough to enable me to draw some half-decent conclusions about travel writing by women. If there are any obvious gaps in the list, then the errors were mine and I hope to address them as part of the much-improved gender balance of my future reading habits! Finally, read my concluding post, outlining seven things I learned from my year of reading female travel writers.